Bonfire, we say takibi, is the great fun when we camp in genryu. We always make a bonfire at camp-site in the evening unless it is hard rain. If possible, we build a fire at riverside, not in the camp-site where we set a tarp or tent. 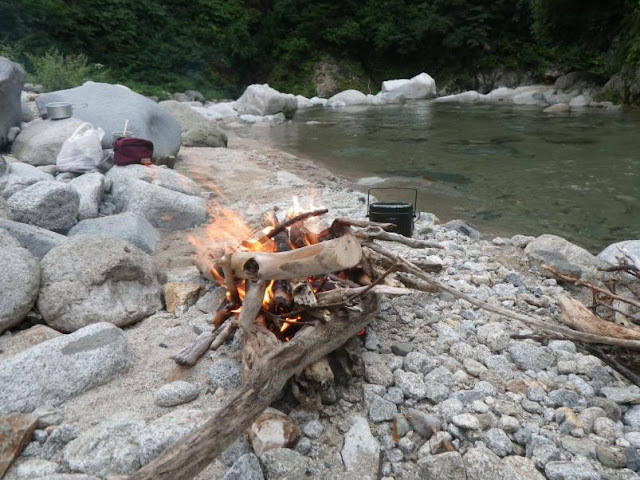 It is because not to make a mess of the camp-site first, and also to enjoy the tasty meals, good drink and fun conversation with friends sitting around the bonfire relaxing and listening to the sound of the river or watching the stars in the sky. Even in the keiryu fishing season it might be very cold in the valley at night. We really need a fire to warm ourselves up. We may need a fire to cook meals too. If we build a fire, we gather around the fire naturally. Yes bonfire offers us a place to enjoy time. I feel not only our bodies but also our minds are warmed up comfortably by watching a bonfire. For building a bonfire, we always take “Three sacred treasures for bonfire” when we go genryu fishing camp. 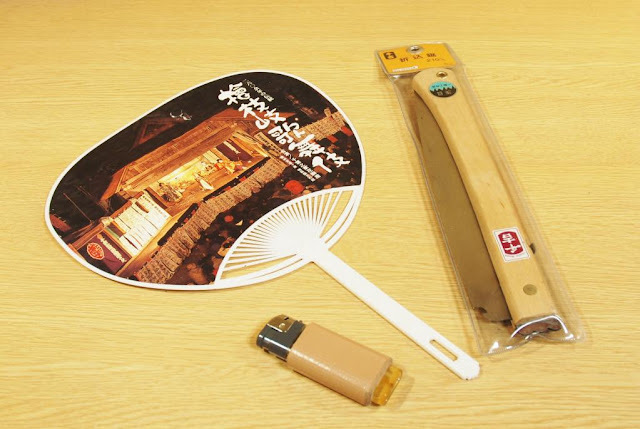 Firstly a lighter, secondly a saw for cutting firewood and Uchiwa (fan) to increase the fire. Those are very simple tools but we can not ignite a fire without a lighter, and it is very hard to make up the fire without a saw and a fan. By the bye, it is very popular for us, genryu anglers, to take the disposable liter wound with packing tape. This packing tape becomes very good ignition agent when we set a bonfire. Also we can use this packing tape for tentative repairing for camping gear or wears. This great idea was invented by Yuzo Sebata many years ago and got very popular among genryu anglers or sawanobori people. 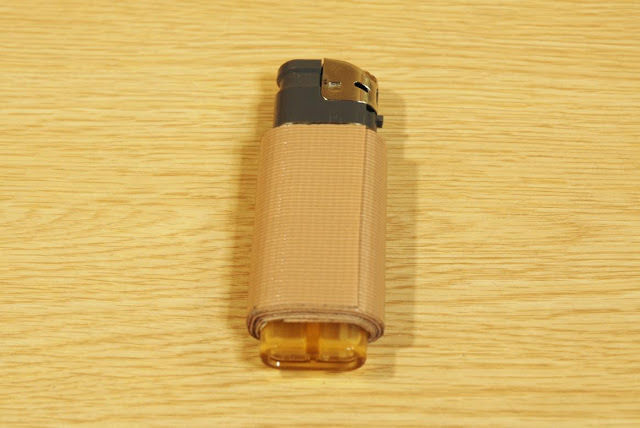 You can make this lighter very easily. Please try this simple but great invention. It is very useful. Just one advice is you should burn test of the tape before you make it because some cheap packing tapes do not burn well. Use cloth type tape. Not paper type. I really think we need a saw to cut the firewood in good size. Some people take a hatchet but hatchet is very heavy and it is hard to cut drift timbers in right size. Folding saw like one in the photo is the best choice for genryu camping. We must have good sharpness one. Uchiwa is the traditional Japanese fan. We use uchiwa to take a cool in the summer or to control fire power at cooking. For making a bonfire we use an uchiwa to send a wind and make the fire bigger. There is a big difference if we do not have uchiwa and try to send a wind using other things. I hear some people take a compact blower but just one uchiwa is really enough and very handy. To make a bonfire, we need to gather firewood near the camp site. Mostly firewood are fallen branches and drift woods. If possible, we should gather firewood right after we set the camp or at least before the dark and keep them under the tarp because it might rain when we are fishing. How to make a bonfire is depending on the person but I hereafter write our way for your reference. 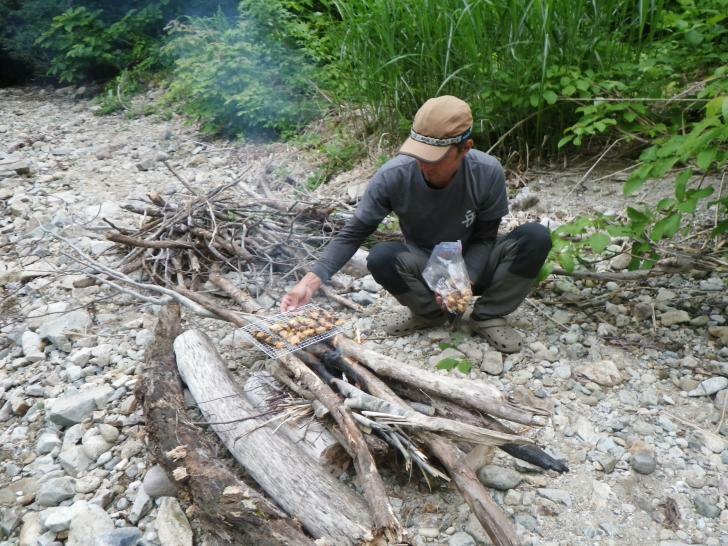 We arrange firewood in parallel to the river, because the wind blows parallel to the river. It blows upstream in a daytime and downstream at night in normal situation. So if you arrange firewood parallel to the river, the wind goes through the firewood and it helps making a fire very much. 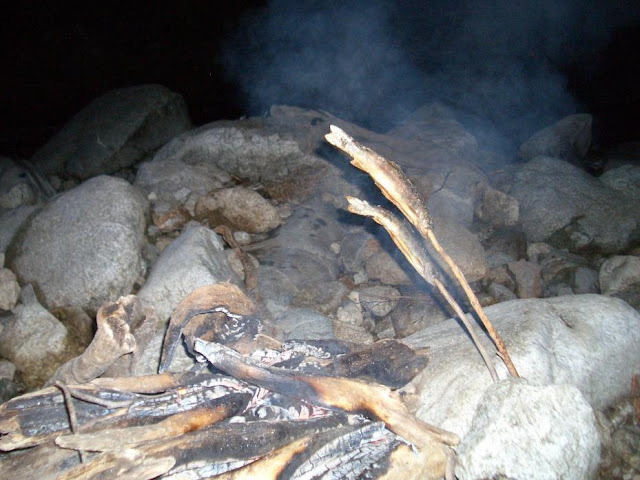 Some people prefer arranging firewood vertically to the river to burn the firewood slowly. Firstly we put 3 or 4 chubby woods to make the fire bed. It keeps heat and makes easy start of the ignition. Secondly prepare one handful very small twigs for ignite fire, and 2 or 3 hands of little thicker branches, then thicker branches and thick woods. Ignite fire to some rolled packing tapes and put it on the fire bed, then put handful small twigs, and 2 or 3 hands of little thicker branches next, then thicker branches and thick woods. Leave them as long as there is white smoke coming up. It means the twigs and small branches are heated up. Then you see small fire coming up then send the wind slowly by uchiwa and make the fire bigger. The fire goes from little twigs to the little branches then to branches and big woods. Once the big woods start to burn, you can leave the bonfire. If there are enough red hot charcoals you can control the fire adding more woods or taking some woods off. Bonfire is an important heat source in the mountains. We use the bonfire for boiling water or cooking, and it saves the gas for the burner or we do not need very light lanterns. 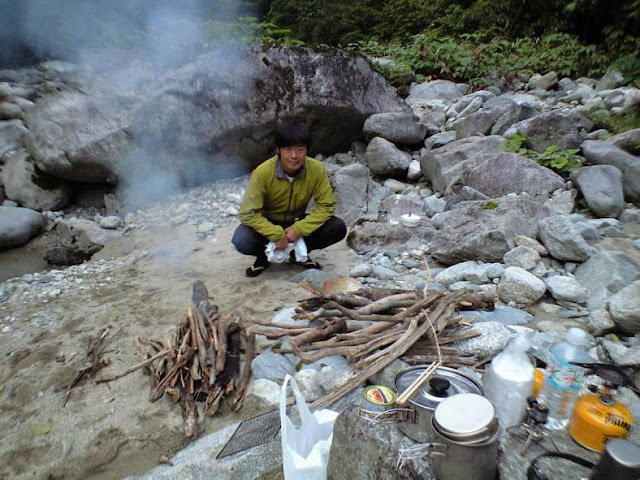 For instance, Yuzo Sebata cooks only using a bonfire generally. In fact it is the best time of the genryu trip when we spend a night sitting or lying around the bonfire and talk with friends drinking. Staying by the fire we could forget the hardness of mountain climbing or fatigue of stream wading for many hours. With the pleasant fatigue of the day and drunkenness of alcohol, we are melting into the night of the valley. At last when we withdraw the camp, we put away the bonfire cleanly even we can not find the mark of the bonfire. Always we must keep tenba (camp site) and surroundings very clean for the people coming to the place next.